Indiana University Bloomington will host the 2019 State tournament on Saturday, March 16, 2019. Planning is underway, including a new website! Check it out!! 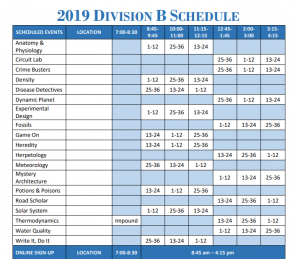 The Indiana Science Olympiad Executive Committee has approved the state schedules (see below). Every effort will be made by our regional tournament directors to follow the state schedules, however regional tournaments typically run across 5 one-hour time slots and state runs across 6 one-hour time slots so there will be some differences. 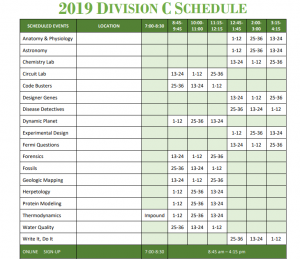 The following trial events were approved by the IN Science Olympiad Executive board and will be held at the 2019 State tournament. Regional tournaments are not required to run trial events but some may choose to do so, please check with your regional tournament director.